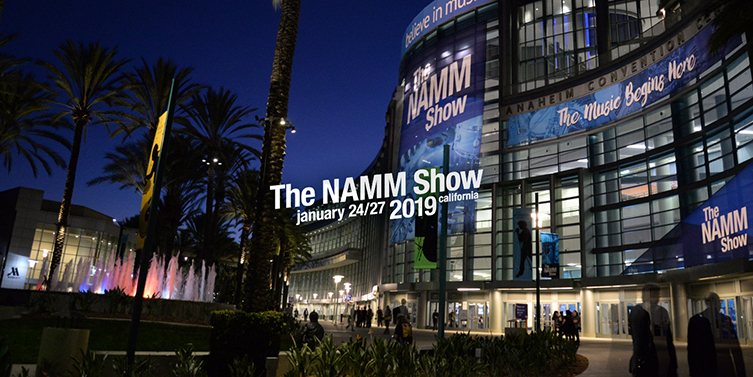 NAMM is one of the world's largest trade shows for music products, taking place annually in Anaheim, California since it's inception all the way back in 1901. This has long been the place where new products are announced and dreams are made. Nothing quite beats off those January blues like seeing all of the amazing new kit coming out this year! There are still plenty of announcements to be made between now and the show, so we'll be sure to update this article as we move forward. Do check back in with us as we move closer to the show for more updates. Let's take a look at what's on offer so far! Korg have really blown us away this year with several great announcements. The Minilogue xd looks to be a firm improvement on the original model. It has been reimagined with several new features, such as the Multi-Engine oscillator that may be familiar to you from the Prologue. There's also an expanded effects section which includes delay, modulation and reverb, as opposed to only delay on the original. The step sequencer has been upgraded from 8 buttons to 16, and microtuning has been added, just like on the Monologue. This is a serious piece of synth for the price, and we can't wait to get our hands on it! To check out the full specs, just click here. Now this is an interesting development in the world of Audio Interfaces! Audient are a company well known for making extremely high quality audio equipment. We're big fans of their ID series interfaces here at guitarguitar, thanks to their extremely high quality preamps and converters. So this was really exciting to hear about for us. Audient have partnered with esteemed audio engineering company Two Notes to produce the Sono, an audio interface designed for guitarists. Sono features a 12AX7 analogue valve and 3-band EQ, as well as Two Notes amp modelling and cab simulation. Meaning you can get a great tone going straight to your DAW software. Sono was also designed to take pedals like a dream, so feel free to fire those into your signal chain just like you would when plugging into an amp! This provides you with the sound you'd expect from a valve amp, as well as two high quality Audient Mic Preamps, one of which can also be processed through the valve. Providing you with that same warmth and saturation on your vocal signal. You can also expand the unit to have up to 10 inputs via ADAT, making recording a drumkit a breeze. Tipping it completely over the edge into must-have territory for us, is it's reamp feature, which removes the need for a separate reamp box. Check it out here! Korg are really starting to push the boundaries with their Volca series of affordable desktop synths, drum machines and samplers. We are really pleased to see the release of something like the Volca Modular, which is a semi-modular desktop synth that is based on 'West-Coast' synthesis (think Buchla Music Easel). It features 50 patch points and eight modules as well as familiar Volca features to help inspire creativity. This is going to be an amazing affordable option for those looking to get into the basics of Modular Synthesis and experiment with new sounds. We might have to pick a couple up for ourselves. Check out the full specs here! So far this is a pretty Korg-heavy lineup huh? They are knocking it out of the park this year with a ton of announcements of amazing looking instruments. The Volca Drum is a digital percussion synthesizer that generates it's sound through DSP-based analog modelling. There are some features such as randomization to the pattern or sounds, and the new wave guide which helps you design some crazy new sounds. Both Volca offerings from Korg look extremely promising and we really can't wait to give them a whirl. Check out the full specs here! 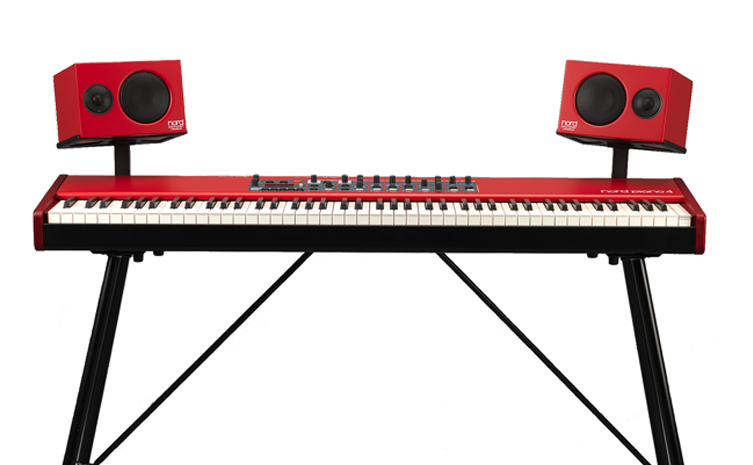 At a glance, the new CP series stage pianos from Yamaha looks a little like another red stage piano we know. However, this looks to be their most advanced stage piano yet. In true Yamaha fashion, they don't waste your time by flaunting flashy bonus features and gimmicks, they just slap down a big lean slice of stage piano that sounds INSANELY good. Both the 73 key and 88 key models have a hammer action keyboard, with a simple user interface that lets you get the sounds you need quickly and efficiently. There appears to be a bunch of super high quality piano, electric piano, organs, pads and way more on board. We were blown away by the piano and electric piano sounds, and can't wait to hear all the rest! Check them out here! 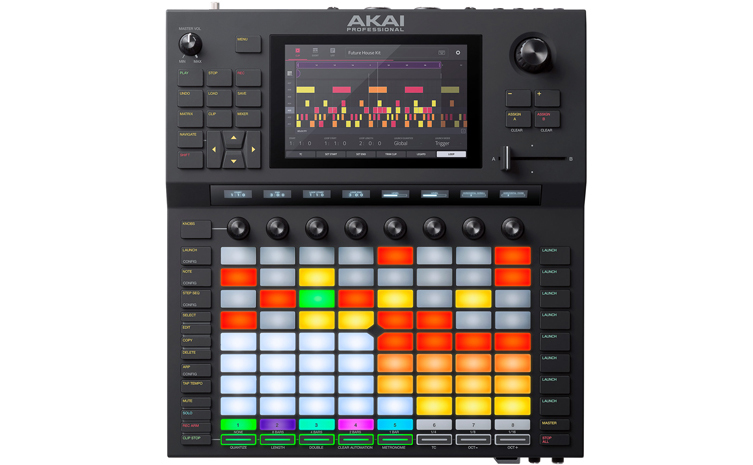 Akai aren't afraid to get adventurous and push the boundaries. Force is a standalone production workstation and performance tool. It's layout may be familiar to you Ableton Push and Native Instrument Maschine users out there. Force uses a clip based workflow, much the same as Live and Maschine software, but takes the computer straight out of the equation. It utilises an 8x8 RGB grid, which can be used to trigger clips, samples, play instruments and sequence parts. While there is a horde of control buttons on board, the display also features multi-touch control so you can control those parameters quickly. On board there's everything you need you build and finish tracks from scratch, as well as Ableton Live integration in the pipeline. This is absolutely worth checking out, whether you want step away from the computer, expand your Ableton based setup or get into building high quality tracks without the need for a laptop. Check out the full details here! Nord have pulled something pretty unexpected out of the bag with the announcement of their new Piano Monitors. These monitors are designed exclusively to reproduce the sound of Nord's electric and acoustic pianos at an optimal level. These look to be THE option to go for, in order to fully experience the true character of piano sounds on your Nord. The Nord Piano Monitor system is compatible with all Nord products and can be mounted on the Nord Piano 4 using optional monitor brackets. We're looking forward to having a listen, and hearing the difference in those legendary piano sounds! IK Multimedia are turning some heads with their announcement of the Axe I/O audio Interface. This is absolutely designed with the guitarist in mind. Featuring a 2 in/5 out layout, with 2 switchable guitar inputs, 2 Microphone/Line Inputs, 2 Monitor Outputs, 2 Line Outputs, a re-amp output, MIDI In/Out, Headphone Output and... *deep breath* Switch and Expression pedal inputs. Not only this, but they've included a tuner in the unit as well. This looks to be pretty much everything you'd need for recording as a guitar player. It does of course also have two microphone/line inputs on the rear for recording vocals, the sound from your amp, keyboards and so on. Not only does this interface allow you to have great control over the tonality of the input stage and plenty of connectivity, you can also use it to control certain features such as patch changes, expression and fx switches within software like Amplitube 4 Deluxe, which is included! As a predominantly guitar playing company, you can imagine just how excited we are to get our hands on this one! Roland have definitely gotten our attention with the announcement of the FP-10 Digital Piano! This is their new entry-level digital piano, which takes a lot of features from the outstandingly popular FP-30. The FP-10 features the exact same 88-Key PHA-4 Standard weighted keyboard as the FP-30, the same Supernatural sound engine that can be found on so many of their amazing pianos and even Bluetooth and USB MIDI functionality. You can also use Roland's Piano Partner 2 App over the bluetooth connection to select sounds, change the metronome speed and more. We are huge fans of the Roland's Digital Pianos here at guitarguitar, and we can't wait to take this new entry model for a spin! Check out the full specs here! Roland make some of our favourite electronic drum kits, modules and percussion pads. The TM-1 brings the opportunity to create a hybrid drum kit for a very small investment. Featuring two mono trigger inputs, you can incorporate triggers or pads into your drumming setup and take advantage of electronic sounds such as claps and sub drops, your own custom samples and way more. Making it different from your usual trigger module, is the stompbox design. You can use the two footswitches to trigger sounds, change kits and mute the module, leaving your hands free to groove away. We think this is an excellent idea. Check out the full specs here! Designed for the touring professional, the Akai MPK Road 88 controller keyboard features a no-nonsense layout housed in a roadcase with a removable lid. It features 88 weighted hammer action keys, which are velocity sensitive with aftertouch. You also have three variable pedal inputs to provide you with optimal control over the sound. This is designed to use within a computer VST instrument setup via USB, or with a hardware sound module via the 5-Pin MIDI connection. There's also a built in soundcard, so there is no need to use a separate audio interface to play back the sound from your computer or sound module. This looks to be ideal for streamlining your live keys setup. Check out the full spec here! Expanding further into the world of affordable controller keyboards, Native Instruments have unvieled the Komplete Kontrol M32. This new controller features 32 mini keys, 8 touch senstive rotary encoders, two touch strips for expression, a TRS pedal input and even an OLED display. There are also many other control features from further up Komplete Kontrol models on board. For a keyboard of it's price range, it really is feature packed, while being small enough to fit in your backpack. We can't wait to try this one out! Check out the full specs here! Not only making their way into the affordable controller keyboard market, Native Instruments are diving into the world of affordable audio interfaces too. There are two new models, the Komplete Audio 1 and Komplete Audio 2. The Komplete Audio 1 features a single XLR input, and a jack input, along with phono outputs. The Komplete Audio 2 features two combo inputs, which can take an XLR or jack connection, as well as balanced stereo jack outputs. What sets these apart from other interfaces in this range is the included software. Native Instruments are well known for providing some of the highest quality software instruments and audio effects, and this is a cheaper way of accessing their world. Check their specs out in full here! 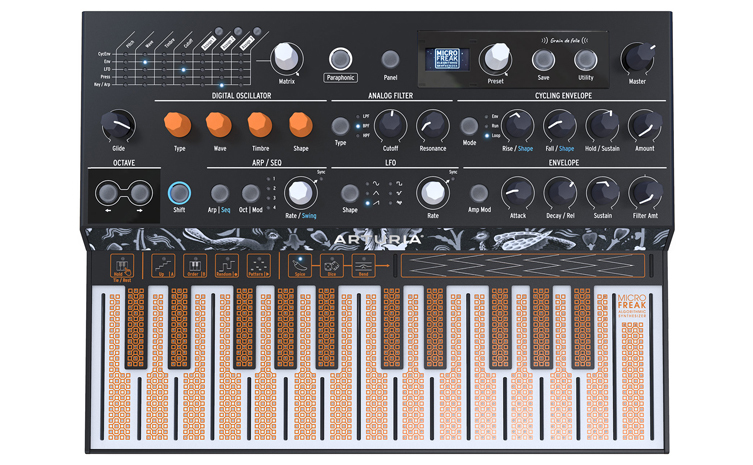 Arturia have come out strong this year with this super-interesting little synth. MicroFreak blends wavetable and digital oscillators with analog filters to provide you with some serious sound design capabilities. It also features a sequencer, mod matrix, a flat PCB keyboard, CV/Gate, MIDI and USB control, as well as poly-aftertouch when used as a controller. This looks to be one of the most unique synths to drop in a while, and we can't wait to try it out. We'll definitely be taking a closer look at this in future. Be sure to read the full specs here! KRK have unveiled their latest generation of Rokit monitors, which look to be their most advanced yet. They feature the same iconic yellow Kevlar cones we all know and love, along with a new LED visual graphic EQ and room correction tools with the KRK App. The front firing port also looks to have been made bigger, for optimised low-frequency tuning. At a glance, these look great, with plenty of control for working with your environment. We're excited to have a listen! Check out the full specs here! We'll add to this list as more hot products are announced, so check back and see what else is on show this year!